What's Tom Gardner recommending for Motley Fool Stock Advisor subscribers? Since we’re still close to being in the afterglow of the Berkshire Hathaway Annual Meeting, when Warren and Charlie (and now Bill Gates, too) are trotted out on CNBC for hours at a time to share their avuncular wisdom, it shouldn’t be terribly surprising that we’re seeing a few “next Berkshire” pitches again. And, of course, that’s what we all want — the chance to put up a small investment and someday own a baseball team and get our alma mater to name a building after us… is that so much to ask? OK, fine, we’ll settle for helping our kids go to College and retiring without panic… who knows, just that might cost $12 million by the time I’m ready to toss my keyboard in the trash and enjoy my golden years. 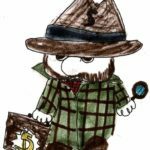 We’ve seen these kinds of promotions for years — lots of folks promise you the chance to get in early on the next Warren Buffett, and they’ve been doing it for longer than Stock Gumshoe has been around… some of my first articles in 2007 were about “next Berkshire” ideas, and it wasn’t a new notion then. “… what if we could find the next Berkshire Hathaway… a company with the same smart leadership that uses Buffett’s disciplined, common-sense approach of leveraging the insurance business to buy other stocks, bonds, and entire companies? And a knack for finding winners in “obvious” places that most people miss? OK, so that’s the “triple buy” part of our headline — apparently this has been thrice recommended by one of the founding Fool brothers (Tom Gardner is generally the more value-focused of the pair, his brother David Gardner, whose record is dramatically stronger, is the one who bets on growth and won huge with stocks like Priceline and Amazon in their early days). What else do we learn? We’re told that this stock is “only 1/30th Berkshire’s size” … that “this mini-Berkshire’s CEO is a charismatic investor and a proven winner” … and that the stock has risen almost 10,000% since it was started 30 years ago. So what’s our stock? This is, sez the Thinkolator, our old friend Markel (MKL). Which I expect I’ve probably owned for about as long as Tom Gardner has been recommending it, perhaps longer. Markel is a specialty insurance and reinsurance company, and the comparisons to Berkshire Hathaway come because they make some effort to emulate Warren Buffett’s insurance conglomerate — they allocate much more money to investing in equities than more conservative insurance companies do, using the value investing philosophy of co-CEO Tom Gayner, who is widely admired as an investor, and they even have been buying up smaller operating companies as well to diversify. 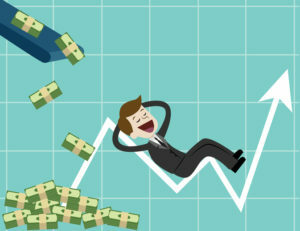 They also are good at communicating fairly with shareholders, and they have much better employee incentives than most companies (they base incentive bonuses not on the share price or the quarterly returns, but on the rolling five-year growth in book value per share, a far superior measurement for an insurance company that’s trying to grow rationally and profitably in the long run). The company has grown pretty dramatically over the years, though the biggest single spurt of growth came with their acquisition of Alterra a few years ago — and the drop of the shares following that acquisition announcement in late 2012 was, coincidentally enough, also the last time that I was really excited about buying more Markel shares. I wrote what I think is my best semi-recent assessment of Markel after my visit to the Markel Breakfast in 2016, just about two years ago (the last time I was in Omaha for the Berkshire meeting, upon which the annual Markel Breakfast is a bit of a lamprey). At the time, I essentially said what I’ve now reiterated several times in recent years: Markel is a great company, I’d be happy to own more of it than I do, and if you can hold on for a decade or more it will probably do pretty well even if you overpay today… but it’s too expensive right now, and a price/book valuation of well over 1.5 assumes too much future success. As I noted, though, that doesn’t mean it’s a “sell” — and I still feel that way. Two years ago, Markel was trading at almost 1.6X book, right around $900 a share, and I thought that was too much. Since then the price/book valuation has risen and it’s now at almost 1.7X book, and book value has also gone up a little bit, so the shares are in the low $1,100s. I’m still holding, and I consider this a core position that won’t be easily shaken loose from my portfolio… but that doesn’t mean you have to buy it when it’s relatively expensive, and I haven’t added to my position in quite a while. The oft-cited comparison to Berkshire Hathaway (BRK-B), unfair though it is to both companies on a basic level, caused me to note two years ago that Berkshire was much more appealing at the time, given its valuation, even though the long-term growth might be less compelling because of its much larger size. And not to pat myself on the back, but that was the right call (I make lots of wrong calls as well, longtime readers will need no reminder of that). Since that Omaha weekend in early May 2016, Berkshire has not seen any “multiple expansion” — it trades at about the same price/book valuation today as it did then — but it has still gained 36% over those two years compared to Markel’s 22% (if you’re curious, the S&P 500 splits the difference, with a 30% return… though if you include dividends, which neither Berkshire nor Markel pay since they focus on compounding returns, the S&P beat MKL handily and only trailed Berkshire shares by about one percentage point). So… Markel is still a great company, and it still trades at a fantastic valuation. But as is the case with the broad market, which we’d probably do well to remember today, if you buy at a rich valuation you should expect your future returns, on average, to be relatively low. And yes, returns have been relatively low for Markel since it got to be really richly valued, so I’m remaining stubborn and waiting for a better price. “Relatively low” doesn’t mean “terrible,” though, and I’ve certainly owned plenty of stocks that did worse than Markel’s 20% gain over the past couple of years since it started to trade in this rarefied 1.5X book+ zone, or that underperformed the broader market for years at a time. I did put some money into Berkshire a few times in recent years, and enjoyed returns that were better than that, even though I think Markel will probably grow faster than Berkshire will over the next 20 years — sometimes you just have to compare opportunities among strong companies and put the money in the place where it’s most welcome at that time… if you’re willing to take some risks, I also think the much more volatile Fairfax Financial (FFH.TO, FRFHF), often mentioned in the same breath as Berkshire and Markel, is a better buy than Markel right now — partly because it has done so much worse than those near-peers. It’s often been tough times since the March 2009 bottom for value investors — Fairfax has returned about 150% since then (woefully underperforming, since Prem Watsa hedged so heavily) and Berkshire has returned about 250%, but both have trailed the 300% gains of the S&P 500… Markel, for what it’s worth, matched the S&P almost exactly for that time period. 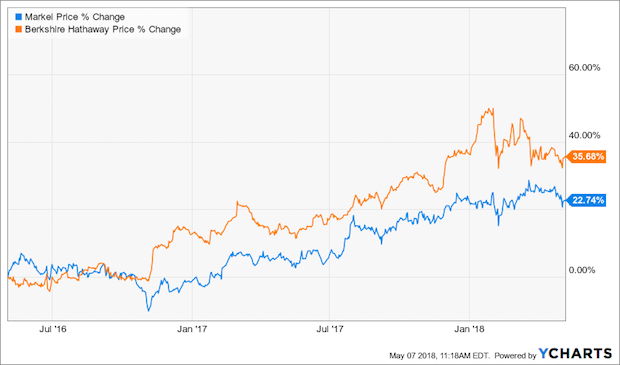 And, of course, I’m “talking my book” in a big way here — as of right now, those three stocks are the three largest individual equity holdings in my Real Money Portfolio, and I’ve added to both Berkshire and Fairfax in the past couple months. So I’ll pass it back to you, dear friends — have I been too pessimistic about Markel in recent years? Is it going to keep doing well? Will all the insurers make me weep in the years to come? Let us know what you’re thinking with a comment below. P.S. Is there any reason to think that Markel looks today like Berkshire did in 1992, as the ad teases? Berkshire had a good year in 1992, gaining some 30% and ending the year at a price/book valuation of about 1.5X… and it surged in the few years after that to trade at really aggressive valuations of almost 3X book value, before the dot-com bubble convinced everyone that Buffett didn’t know what he was doing (because he was avoiding the tech stocks we all loved). But it was, and I suspect this is Gardner’s point, almost exactly the size back then that Markel is now, with a market cap of roughly $15 billion. Of course, that would have been a good time to hold on, despite the fact that Berkshire underperformed the market for a couple years and missed the dot-com surge (and crash) — if you had bought Berkshire shares in 1992 and just held on and ignored the price fluctuation, you’d be up about 2,500% today (the S&P 500 since 1992 is up almost 900%). Even better, if you’d been willing to bet on the tiny guy and bought Markel back in 1992 when it was a $150 million company no one had ever heard of, you’d be up 3,200% or so. Disclosure: As noted above, I own shares of Berkshire Hathaway, Fairfax Financial Holdings, and Markel. I will not trade in any covered stock for at least three days following publication, per Stock Gumshoe’s trading rules. 26 Comments on "Revealed: “Motley Fool’s Triple Buy Alert Looks a Lot Like Berkshire in 1992”"
A bit pricey, don’t you think? You’re a lot pithier than I am… but yes, I do think Markel is a bit pricey these days. Still own it, still a great company, but a bit pricey. That’s a lot to pay for a stock with no dividend. Your insight and research is so above the best of the best, Travis. You are amazing, saving so many thousands of investors and traders misery. Thank you for the efforts. Just clicked on this thread. I purchased some Markel way back in January of 2006 upon some recommendations in the Motley Fool MDP service (now that’s another story) for $484 per share. I finally gave up and sold them in August 2010 for $336 per share. The Motley Fool seems to be perpetually recommending this company. I have had some good picks from them, but not sure continuously picking a stock and then narrowing in on one successful time period to tout performance statistics around is a true representation of your stock picking prowess. Motley Fool wants people to buy because they want to dump their stock. On February 5, about the same time as the “Triple” recommendation from MF, Markel’s investments officials quit the company. What does that tell you? It should tell you that this not a good buy right now and who wants to wait 30 years for it to grow. Exactly what I told them many years ago when they switched to this clickbait marketing style (before clickbait was a term). They figure themselves to be a sheep in a wolf in sheep’s clothing. They’re definitely one of the most reputable newsletters out there for those who enjoy the feeling of being on the wrong end of a fishing pole. I bought it in 2007 as a “BRK”-like buy and see you in retirement stock. More or less happy with my 140% return, but I also bought AAPL in 2007 (half as much investment), and prefer its 990% return. Sigh. Balance is good — no one gets to know which of our picks will be best in advance. No more sighing, you did great! MKL haunts me Travis. I purchased quite a few shares at $420, financial crises hit and it pulled back 40+% as I kept buying all the way down to $250. My average was about $350 after all said and done. Long story shorter, I sold 100 shares when it reached $775 and left a substantial amount on the table. Should have put a trailing stop in place. I suspect once the next bear hit…and it will, there will be a better price to hop back on the Markel train. I don’t think it will ever be $350 again. Sitting at @$1100 a share… hard to argue with MF success and long term thinking. Quite true, of course, as so many things are true in retrospect. Every stock bought or held is a balance of the risk versus the reward — There are a lot of stocks that I’m happy with not because I’m sure they’ll lead a bull market, but because I’m pretty sure they’ll hold up well in the bad days that always eventually come. Jim Puplava has a very long retirement income series podcast – it is a few years long series just to show how wide the issue can be. He had done absolutely A+ job on this topic and probably picked it to the bone. Thanks for your great service. It seem that the purpose of just about every “tease” is to sell newsletters. I read many teases, then proceeded to ignore them because typically they contain only a kernel of truth. But I still have my curiosity and you tell us the truth and help us decide whether to be interested at all. I recall one case where I actually invested in a “teased” company because you advise that it was sound and did OK on it. Motley Fool’s newest email hype is about Amazon’s Project Vesta (domestic robots) and the “secret” stock they claim is the supplier Amazon uses. Any idea what multi-bagger they’re touting in this new Motley Fool promo? What about Motley’s pitch on “mini- Berkshire stock? Any thoughts on the company? Blue horseshoe loves Glowpoint communications. Are they being paid to love them? That’s a teensy little penny stock, not much of a company there and they shouldn’t be public, I think they’ve paid for promotion in the past but haven’t seen the Blue Horseshoe recommendation (if they were paid, they’ll likely disclose it in the fine print). Rating: 3.6/5. From 128 votes. What’s Tom Gardner’s “I’m Betting $523,111 on This 1 Stock” Pitch About? What's the latest "double down" teaser from Motley Fool Stock Advisor all about? What's the latest Motley Fool Stock Advisor pick being teased? What's David Gardner's latest recommendation for Motley Fool Stock Advisor?